Running Press Kids, 9780762453399, 40pp. 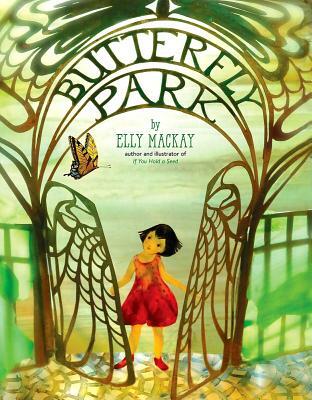 Determined to lure the butterflies in, the girl inspires her entire town to help her. And with their combined efforts, soon the butterfliesand the girlfeel right at home. Elly MacKay lives in Owen Sound, Ontario, Canada with her husband and children. She is the author and illustrator of If You Hold a Seed, which was selected for The Original Art show by the Society of Illustrators, and Shadow Chasers. Her artwork is sold around the world including at her Etsy.com store, Theater Clouds. "Centered on the park's elaborate art nouveau gateway, MacKay's lyrical paper collage and diorama constructs feature layered details and out-of-focus backgrounds for a sense of depth. Brightly patterned butterflies, delicate flowers, and human figures pose like gracefully off-balance dancers. . . . Worthy of theme and equally pleasing to the eye and the spirit."